I’m a sucker for lists but I don’t normally make them myself. However, there is so much going on around here that it’s hard to keep track. So, I’m putting together a list of the top 10 projects to watch in 2014. In the past year, the stage has been set to make this year one of most transformative years ever in North Fulton. 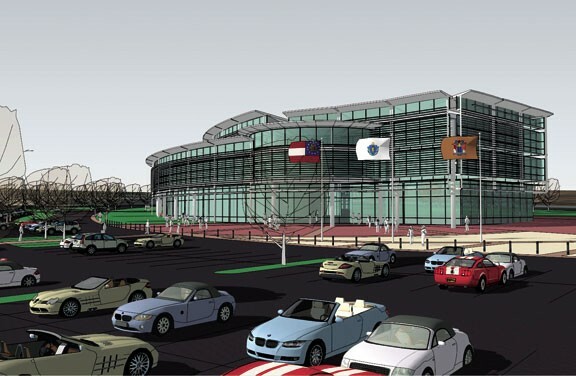 These projects will increase walkability and overall livability in North Fulton. 10. Gwinnett Tech Expansion - Construction of the new Alpharetta Gwinnett Tech campus will be in full swing in 2014, keeping them on track for a Jan 2016 opening. The depressing thing about the campus is that it appears to be a very 90’s and early 00’s suburban office park site design which shows 3 story’ish buildings surrounded by a sea of parking. 9. North Fulton CID Blueprint 2.0 - The North Fulton CID released its vision for the next 7-10 years in Dec. and there are some projects that may gather momentum in 2013. They focus on reducing traffic congestion, adapting to changing marketplace trends, and eliminating bureaucratic hurdles. 8. 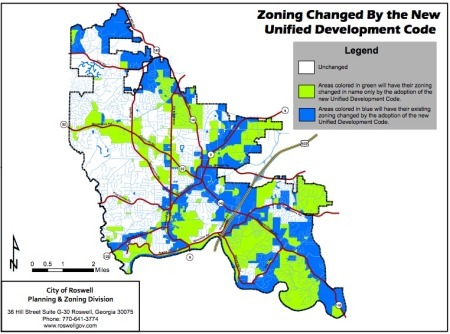 Roswell Downtown Development Authority - The DDA was relatively quiet in 2013 but expect Roswell to make some waves in the next year with plans for large scale projects in the heart of Roswell. They launched their website (www.roswelldda.com) in 2013 and have posted several theoretical master plan images. Their plans for a park or green at City Hall would be a big win if executed properly. 7. MARTA Rail - In late 2013, MARTA officially announced that it is looking to extend from North Springs station further north to Windward Parkway. This was received with mixed emotions but many people recognize that more lanes on 400 is going to be costly if not impossible. The current preferred alternative is to extend heavy rail and add five stations (Northridge, Holcomb Bridge, North Point, Haynes Bridge and Windward). Expect more news on potential funding sources and routes in 2014. 6. 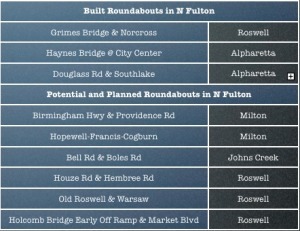 More Roundabouts - In the past two years at least four roundabouts have been opened in North Fulton. Readers are familiar with my thoughs on roundabouts and there is empirical evidence that they improve traffic flow, reduce crashes and increase safety. More of them are coming to intersections near you. 5. Roswell Unified Development Code - Roswell has been opening its doors to business over the past 18 months. There have been several high priority corporate announcements in that timeframe. That said, the zoning codes are confusing web of red tape and must be changed. In 2014, expect passage of the new UDC and the accompanying Design Guidelines. This will send a message to developers that Roswell is serious about redevelopment. It will also enable a number of projects to finally take a step toward reality. There are several notable projects that are simply waiting for UDC adoption before going to the city to begin the process. 4. 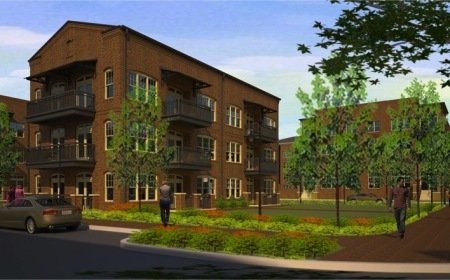 Canton Street & Downtown Alpharetta Infill - No fewer than five projects around Historic Roswell have been brought before the city in the last several months to add townhomes and residences around the Historic Roswell area. There are 80+ total units proposed and a number of them are likely to be finished this year. Add this to the 320 new apartments and the Historic Roswell area could be netting 500+ new residents in the next 12-18 months. Alpharetta’s downtown is experiencing a similar trend albeit with more multi-acre lots available for development due to large site foreclosures following the real estate crash. These developments will help drive local businesses in the downtown areas that thrive on pedestrian traffic. 3. Roswell City Walk Apartments - Or should I say, Down Goes Frazier! The horribly designed 1960’s era Frazier Street Apartments were demolished in December making way for Lennar Miltifamily’s 320 unit luxury apartment complex in the heart of Roswell. The construction will take much of the year but the first tenants are expect in late 2014. When complete, this development will be a game changer and will serve as a catalyst for future projects. Grocery store anyone?? 2. Alpharetta City Center - It would be hard to top this project given its hefty price tag ($31 million), laudable site plan and ambitious construction schedule. In the next 12 mos, you will see the heart of the new Alpharetta change dramatically. Already, there are some new streets in place, with a roundabout, and the new City Hall building is beginning to take shape. The parking deck and library will follow not too far behind and the addition of park space and a pedestrian orientation will be impressive. This, as previously mentioned, is helping spur adjacent development. 1. Avalon - This project dwarfs all the others on this list. It’s hard to downplay the significance of this behemoth. Total economic impact could be over $1 billion when all is said and done. The construction at the site over the past 2 months has been frenetic and leaves little doubt that North American Properties will hit their Q4’14 target for opening phase I. This project is regionally significant and is being watched by the commercial real estate industry nationally. The combination of live, work and play gives Avalon major mixed-use cred and makes it unlike almost any other development in the region. The tenant list is impressive with top-notch national and local restaurants and retailers. 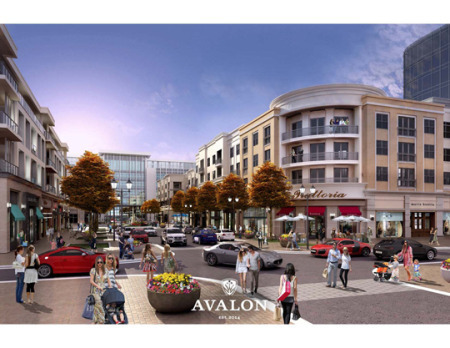 When Avalon opens its streets in late 2014, it will serve as a showcase for walkability and urbanism in a suburban environment. It will be interesting to see how it impacts other popular destinations such as North Point Mall and Canton St.
That’s a lot to chew on and undoubtedly, something else will creep up in 2014. There are even some regionally significant projects that you will want to keep an eye on; the Stadiums (Braves & Falcons), Atlanta Street Car, College Football Hall of Fame, National Center for Human Rights, and Buckhead Atlanta just to name a few. Happy New Year and have a great 2014! Here's a recap of our top 31 of Historic Roswell rankings. We did take our own liberties with the #1 spot but what the heck, it's our blog. The rest of the top 31 we feel are legitimately chosen and ranked. There is defintiely some room for argument in how they are ordered and I'm sure some things are missing from the list. If you have any comments, please let us know. Happy New Year! Yes.. that's the view from our patio on Christmas day 2010. Vickery Creek, The Covered Bridge and the National Forest are our backyard. Sure am glad I don't have to mow that and you really wouldn't think it was a 'creek' down there when you hear the constant rush of water. This may be a bit of a disappointment to most of you but it is truly NUR's favorite thing about Roswell. We probably wouldn't have moved here if it weren't for the view from the back patio of our condo in Mill Street Park. It truly is breathtaking and reminds us every day of just how lucky we are to live in a city that embraces it's parks and environment while also emphasizing responsible development in its historic center. It reminds us that you can have mixes of use within a small area while still maintaining privacy. Within view from our patio are, single family homes, townhomes, condominiums, an office building, a church, a city park and a national park. That's a lot of uses and building types to have in your backyard. We need more sun in the afternoon. But until we are able to change the orientation of the planet, we're going to have to live with it. Thanks for reading our top 31 things in Roswell and we hope everyone has a safe and happy new year! We apologize for not making these updates daily as planned but I'm sure everyone understands that things get a little busy during the holidays. We'll have an update out with all 31 in the next day or two. image: Yelp Melanie N.Why We Love It..
Who doesn't love great food close to home? 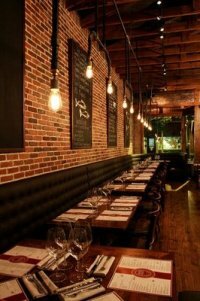 The dining options in our neighborhood range from affordable to fine dining and almost everything in between. There are over 20 eating establishments in Historic Roswell alone with a number of others just on the periphery of our neighborhood. One huge bonus is that we don't have any fast food establishments in the heart of the historic district which is fantastic. Virtually all of our restaurants are locally owned establishments so our dollars stay in the community instead of feeding into a corporate profit center. We would love to see a good Italian restaurant on Canton Street. We have Sugo and Amalfi at the southern end but they are not very walkable in their current locations. image: Roswell Historical SocietyWhy We Love It..
Canton Street is an excellent example of what we are about here at NUR. It incorporates elements of mixed-use (residential, commercial, retail, restaurant, park) all along one walkable street. The key to it's success if having all of these uses in close (walkable) proximity of each other. It defines our City and is our centerpiece. It was recently won the 2011 Great Street award given by Georgia Planning Association. They dubbed it the "hottest scene outside the perimeter." I'd tend to agree with them. The street is innately historic and has incorporated a great deal of adaptive reuse in the buildings. Former homes now host a wide variety of businesses and shops. Former businesses are now restaurants, shops and salons. Uses they were never intended to have but they work because they weren't designed to do just one thing forever. Do you think any of our suburban subdivisions will have this kind of success 80 years from now? It's probably unlikely. The nature of the place is what has made it successful. The street is home to some of Roswell's most successful events such as Alive After 5 and the Roswell Criterium which bring a steady draw of visitors to the area. It is also home to one of the greatest concentrations of unique and tasty restaurants in suburban Atlanta. Add to all of this, the fact that it is insanely picturesque and you have a successful street that is serving as an example to many other places in our region. Hard to Say.. It's difficult to argue with its success. We'd like to do something with the parking lot at the intersection of Canton and Magnolia and figure out a way to get the old Antiques building outta there and bring a development to the street. Additionally, a parking deck solution might eventually be warranted but we're not 100% convinced that it's needed yet. Our Festivals and Events are part of what make our historic district special. They are part of the social program that makes our city more than just a collection of subdivisions. People get out into our mixed-use historic district and enjoy themselves, meet others and learn about our city and cultural heritage. Yes, we know The Chattahoochee National Recreation Area and Vickery Creek Park just came in at #6 and the Covered Bridge is part of that park. However, the Covered Bridge is iconic. It is arguably the most recognizable single symbol of Roswell. We love it because it was a transformative project that took thought and political will to make happen. It was expensive and will never 'pay for itself' but that's not the point when you're placemaking. Just show someone a picture of the bridge who has never seen it and watch their reaction.. Nothing... We'd build another signature bridge. Actually two. 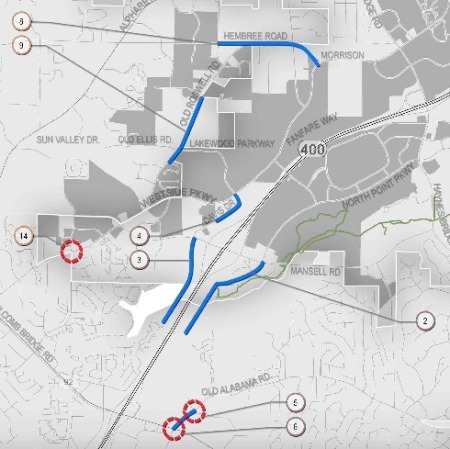 One is already in the planning stages to link Sandy Springs and Roswell for pedestrians and cyclists. If we had our way, it would be a replica of the original bridge over the Chattahoochee that was burned during the Civil War. 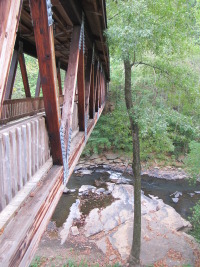 The other bridge would connect the Chattahoochee National Rec Area to South Atlanta Street about 3/4 of a mile downstream from the Covered Bridge. I hear some dreamers want to put a suspension bridge around that spot. Not a bad idea. Kudzu and Poison Ivy.. We'd get rid of 'em. They stink. Photographers... There are too many of them. The covered bridge is a huge draw for engagement photos, wedding photos, christmas photos, etc. It can be difficult to just go hang out and enjoy the scenery for fear that you'll have to move to get out of a picture or that some photographer will lay claim to a certain spot that generally is the most picturesque spot. These aren't just casual point an clicks.. these are set-ups with the whole shabang of photo equipment which take 5-10 minutes at a time. But, I'm guilty of it too. It's just too darn picturesque. Figure out a way to get the wastewater pipes somewhere else. That's a toughie though. It's an amazing community building festival that actually has staying power. It just finished it's 6th year and is going as strong as ever. I've been to a lot of things like it but they usually seem cheesy and contrived. Alive After Five just seems natural. Maybe it's because of the location. Canton Street is so organic that it's hard to feel like anything there is manufactured or shallow. Small business retail and restaurants need this type of exposure and critical mass of customers in order to succeed. The businesses along Canton Street have hit a home run with Alive After Five. Event's like this bring attention to the importance of a good public realm, especially in the area of sidewalks. It helps to remind us that our city is for people and not cars. Keep it up and we'll have a sustainable, walkable, livable town center where people actually want to live. That's already happening and Alive After Five continues to remind us every month between April and October. I get the need for traffic flow but it's just a pain. With the sheer volume of people at the southern tip of Canton Street, it might be a good idea to close the street down to car traffic from 5-7pm from the Norcross St intersection down to the Atlanta St intersection. This would hand over the entire public realm (sidewalk, street and corner park) to the people which is what Alive After Five is really all about. image: Flickr - www78Why We Love It.. This is yet another excellent example of historic preservation and adaptive reuse in our neighborhood. The original buildings are 160+ years old. The charm and character that the Bricks exudes is hard to quantify. It really captures most of what we are about at NUR. It proves that density can be done tastefully while still affording a significant amount of privacy to the residents and not negatively impact the neighborhood. In fact, the neighborhood is better off because of the increased density which is the case in virtually all the places where tasteful density is added. Many small details in the buildings are actually upcycled from the original buildings. The doors are made from the old floors. Some of the old shingles became backsplashes. The little things matter when you're making a place and the Bricks do just that. There's really not much to change. These places are top notch in every way.